My good luck began this spring with a three-year-old thoroughbred named Justify. 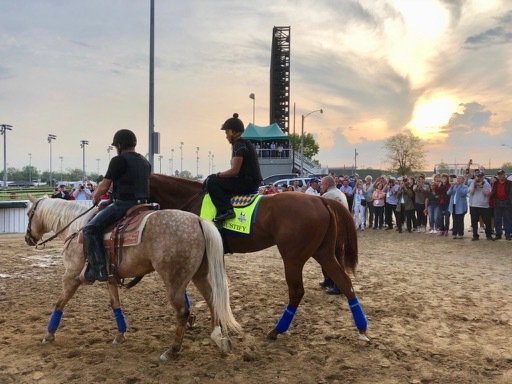 I was smitten the first moment I saw the beautiful chestnut-colored horse walk onto the Churchill Downs track for a short gallop. I knew right away, early in the morning, two days before the Derby, where I was headed with my bet. I put Justify on top, followed by second and third place finishers, and won the Trifecta. Don’t begrudge me. I’m entitled to a winning Derby Trifecta once in a lifetime. Justify went on to win the Preakness and the Belmont to claim horse racing’s Triple Crown. I didn’t press my betting luck at the Preakness and Belmont. Luck can carry you only so far. 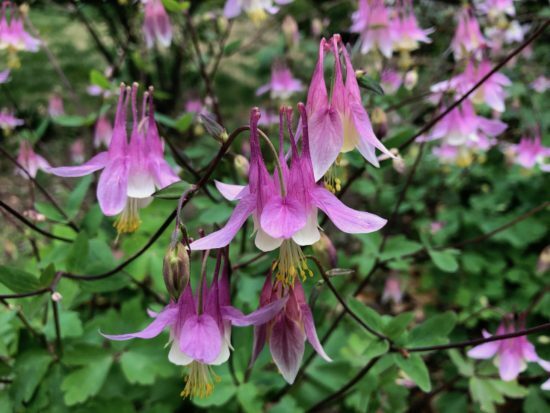 The self-seeding Aquilegia canadensis ‘Pink Lanterns’ on May 8th, a few days after the Derby. Gardening is not so different. 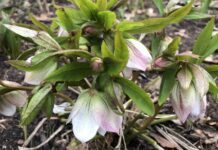 There have been beautiful days in Kentucky this spring when our garden approached epiphany, but they were scarce; yet the miserably hot days didn’t discourage me—too much. April was the coolest April on record; May was the hottest. June has been hotter than May. I’m surprised I’ve enjoyed this spring as much as I have. My back hasn’t gone out, and I haven’t gotten eaten alive by chiggers. 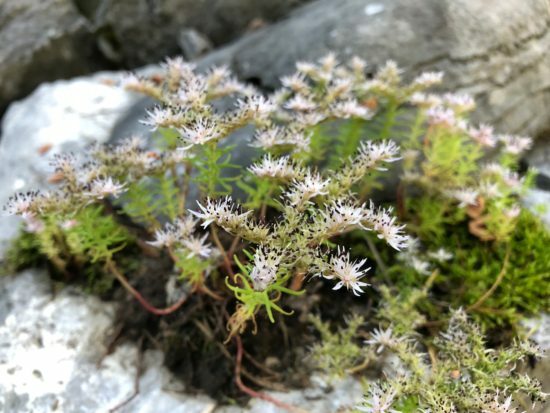 Sedum pulchellum on a rock wall on May 27th in Salvisa, KY. Talk about drought tolerant! Spring growth was phenomenal. Friends have made similar observations. We wondered if we’d somehow lucked out. We weren’t sure if what we were seeing was real. It was like we all saw a flying saucer at the same time. I’m not sure if this season’s luscious growth on trees, shrubs and perennials can be quantified. It doesn’t matter. We had rain when we needed it, sometimes too much, but our little trees and shrubs, planted over the last few years, shot up with steadfast determination. 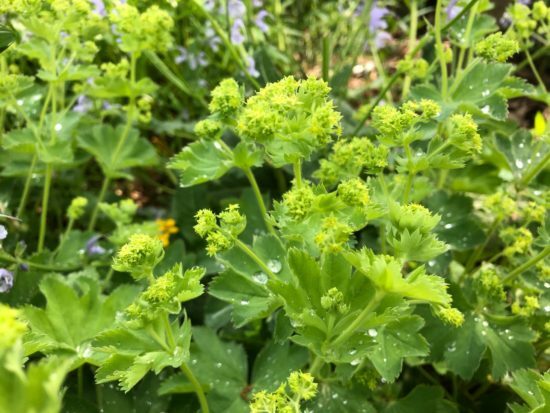 A newer lady’s mantle, Alchemilla sericata ‘Gold Strike’, held up well in the May and June heat. May 22nd. All of this is in spite of dangerous signs politically, culturally and environmentally. Maybe my good luck was a coincidence? I try not to dwell on bad news. It’s a chaotic and disturbing, time but I’m taking a long, optimistic view on the future. I’m good with a little compunction. It won’t hurt, and, if you buy in, you won’t want to contribute to a Political Action Committee (PAC) to peddle influence. 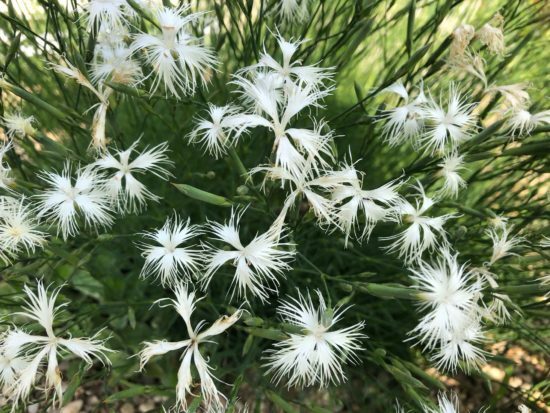 The sweet-scented, fringed blooms of Dianthus arenarius ‘Little Maiden’ on June 6th. I need to return to more Marx Brothers movies, and I promise to vote. I will also try to be kind to my neighbors and garden like there will be a better tomorrow. I don’t ask for much. Free elections with a huge turnout, a lot more respect for human decency, stronger communities and a proliferation of environmentally friendly dirt-grubbing Garden Rant-loving gardeners would suit me fine. 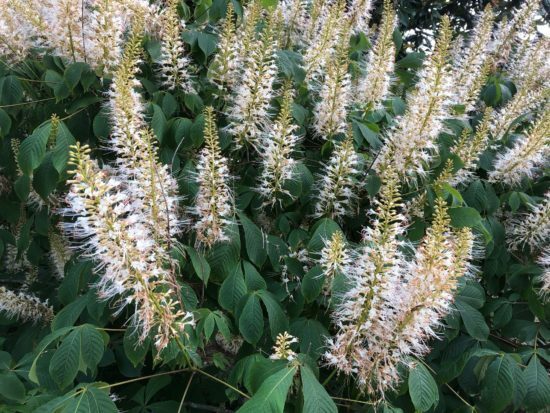 My favorite June-flowering shrub, bottle-brush buckeye, Aesculus parviflora, on June 14th. My tomatoes are growing fast and look good. I had my first, fresh tomato yesterday. It was cracked and gnarly but mighty tasty. The inevitable onslaught of fungal and blight problems hasn’t begun. The Japanese beetles and hollyhock rust are in a horse race to see which one can defoliate my hollyhock leaves first. I can’t think of much I can do, or really want to do, to get rid of either. 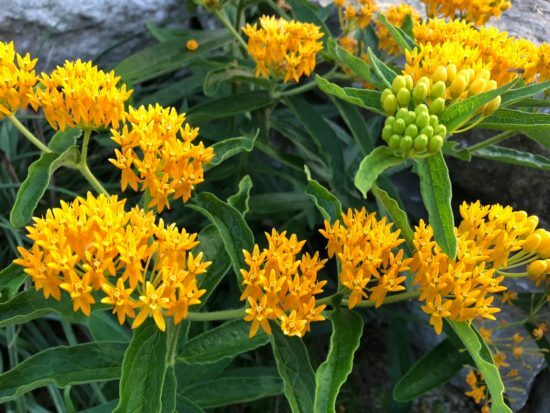 The butterfly weed, Asclepias tuberosa ‘Hello Yellow”, on June 19th. It’s been way too hot the last few weeks. There is so much to worry about. Maybe it’s time to make another bet. The corn top’s not ripe, but the meadow’s in the bloom. 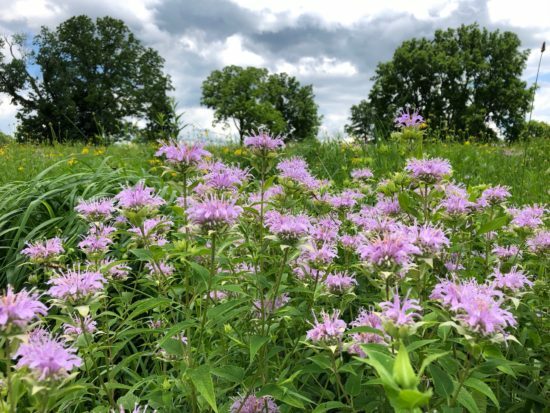 Wild bergamot, Monarda fistulosa, on June 24th. The smart money is on Thickening Weeds. I’m leaning toward a Trifecta bet full of long shots. I’ve got a ridiculous hunch about Cool Breezes, Soaking Rains and Joyous Moments. I can guarantee a good summer if all three hit the tote board. Allen, I wish you luck! I think we may have different political views, but I think we could be friends. I just wish everyone could see the love of beauty we share in the garden and see that is the way to put things in perspective. We must ALL live together in harmony if we are to reap the great promises our country was founded upon. Please excuse the political digression when the subject should be our shared passion for gardening. May you also pick another Trifecta! Ken, I wish you luck, too. Happy gardening. Love it Allen. See you at Cultivate? Thanks, Ruth. 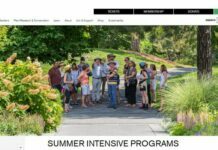 Won’t be at Cultivate but will be in Raleigh for PPA. Hope to see you soon. Thanks for a lovely and optimistic essay. I just heard the news about Justice Kennedy retiring, and am feeling sad and oppressed. Here’s to a trifecta in democratic politics this year! Thanks, Deborah. I’m optimistic long term, but short term I can’t figure out why more people don’t vote. Maybe, this November? I hope so. ☺. I hit the trifecta on the derby once too but my horse (smarty Jones) didn’t win the triple crown. I got to see him lose at the Belmont stakes that year. Well I will wish you luck because we all could use that and I think your bet (optimistic on the future) is the smart money. I loved Smarty Jones. What a horse! Lots of luck to you, too, Karen. I like your optimism. I think the sure bet is Weeds and plenty of sunshine. Lisa, you can bet the ranch on weeds, summer heat and humidity. Thanks, Jennifer. See you in Raleigh. I only spent 18 months in chigger country but it was memorable. When choosing a place to retire, No chiggers was one criteria. I think I’d miss chiggers if I didn’t have them around. I’m kidding! I’m trying to figure out what to do with armadillos when they finally arrive. There in the southern part of the state but headed my way. If it’s not one thing, it’s another. I share your long term view, nature bats last. From that view it’s all good. The short term, not so much. I’m thankful for the healing power of gardens and natural spaces. Much love! I’m with you all the way, Barbara. I’ve been thinking of your mom this week. My first tomato was delicious. Well said,Brother!The more time I can spend in my Iowa garden,the less I fume. Dangerous signs definitely. I’m retreating to my garden more and more to clear my head and relax. Just noticed my new Evening Primrose blooming this morning, so it was my first garden treat of the day. I love your Butterfly weed – mine is just about to bloom. I didn’t think it would return, but it surprised me. I’m hoping for a welcome surprise in November as well. DUCK SOUP! One of the greatest subversive antiwar and antipolitics films ever made, and wildly funny to boot — indeed, one of my top ten favorite movies of all time. 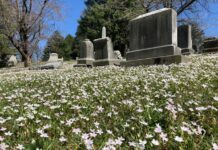 Here in Nashville, spring was also about 22 minutes long, a brief, easy-to-miss spell between the late hard freeze and the onset of 90+ temps with humidity to match. Like KY, lots of rain, though. Very green.